Wearing retro kicks doesn't always have to include Air Jordan's. The Nike Internationalist is a cult classic. This timeless shoe debuted in 1982. Before Nike signed Basket Ball players for lucrative multi million dollar endorsement deals there was the Internationalist. This long distance running shoe was the star in Nike's first ever television commercial. The reason I picked these shoes is because there aren't any gimmicks, air bubbles, straps or crazy colors. I needed something simple that looked great with denim or washed chinos. A gym shoes that doesn't look out of place if I throw on a sport coat and a baseball cap for a quick run to Home Depot. The simplicity and the versatility of this shoe captivated me. This comfy reasonably priced sneaker is true to size and is reasonably priced at $85. You should pick up a pair not for running, but to look cool while running errands! ​ My search for a natural deodorant that actually works! Since getting married 3 years ago I have become more and more conscious of my health. This includes being selective about what I put in and on my body. During my weekly reluctant trip to Whole Foods, I mentioned to my wife that I was running out of deodorant. She guided me to an aisle to choose from a shelf full of natural and aluminum free deodorants. With a smile (I couldn't quite tell if it was an evil, smug or happy grin -- if you knew my wife, you'd know what I mean), she tossed over the Tom's aluminum free natural 24hr Odor protection. On Monday morning I tried it out. Just like any morning, I put on my deodorant immediately after a fresh shower. The first thing I noticed was that it took some time to dry after applying. Weird. Normally, when using a typical brand like Degree this is something I ordinarily don't think about. I jumped into my Monday work routine without a second thought. Meetings, conference calls, bull shiting with the fellas, my mom calling me 8 times -- the usual... To make a long story short I could smell my pits by lunch. I didn't even have to raise me arms. It was just there. Ever present. I kept my arms glued to my sides for the rest of the damn day (definitely an evil grin). 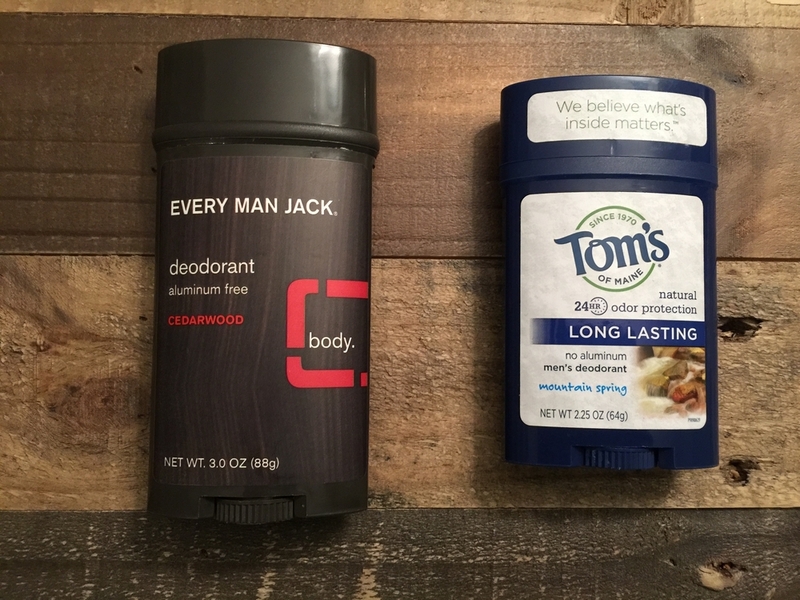 I immediately went back to the store to try a different brand; Every Man Jack Deodorant - Cedarwood. This stick worked a little better, but nothing like the 24+ hr odor protection that you can find from the tried and true favorites at your local drug store. So after my second attempt (yes, you only need to smell your own funk while sitting next to your vice president in the board room once to know that it ain't gonna work) it seems that finding a natural deodorant is an insurmountable task. Bros, do you have any suggestions? I seriously need you \ to help me find a good natural deodorant that won't leave me with bad BO. Comment below. In the meantime, I will continue using my trusty aluminum ridden deodorant till I can find a better solution. It's Friday Night. The club is packed and the music is jumping. You'er a little nervous. You have only dated her for a little over a month. You want to break the ice as quickly as possible. One of the absolute first things that you want to do is get you and your companion a drink. The more you drink the better you dance. The better you look. She takes 10 minutes to tell you that she wants a freaking apple martini and you're off. Or so you thought. Every guy has the same idea as you do; go to the bar and get back to her as fast as I can. The line to the bartender is ridiculous. Everyone is competing for the same thing; the Bartender's attention. Scope your spot: The best place to be is right where the drinks are mixed. The distance you are from the center is directly proportional to your wait time. The farther you are the longer you wait. The bar-back can't save you from your thirst. Make eye contact: As your bartender moves around to serve other patrons track them with your eyes. This shows your intent. Don't make hand signals. You will look like a jerk. Just keep staring. Creepy works better than jerky at the bar. Be Ready: Have your money in hand. Don't take it too far -- remember that your bartender is not a stripper waving your money around is a surefire way not to get served. Leave A Good Tip: On a busy night make it 30%. Or be prepared to wait even longer on your next round. The bartender is there to make money and its in their best interest to serve as many happy drunk customers as they can and get a fat tip. The tactics above have worked for me. What works for you? Comment below!